American engineer mission specialist astronaut 1978-1993. First African-American in space. Flew 144 combat missions in Vietnam. Status: Inactive; Active 1978-1993. Born: 1942-11-22. Spaceflights: 4 . Total time in space: 28.69 days. Birth Place: Pennsylvania. PERSONAL DATA: Born in Philadelphia, Pennsylvania, on November 22, 1942. Married to the former Linda Tull of Philadelphia, Pennsylvania. They have two grown children. Hobbies include reading, swimming, jogging, racquetball, handball, scuba diving and golf. EDUCATION: Graduated from Overbrook Senior High School in Philadelphia, Pennsylvania, in 1960; received a bachelor of science degree in aerospace engineering from Pennsylvania State University in 1964; a master of science degree with distinction in aerospace engineering from the Air Force Institute of Technology in 1974; a doctor of philosophy in aerospace engineering with a minor in laser physics from the Air Force Institute of Technology in 1978 and a master in business administration from the University of Houston, Clear Lake, in 1987. He has also attended the University of Pennsylvania, Wharton School of Business. PROFESSIONAL AFFILIATIONS: Fellow, American Institute of Aeronautics and Astronautics; Board of Governors, National Space Club ( 1997 to 2001); Board of Directors, National Inventor's Hall of Fame Foundation (1997 to 2002); Board of Directors, The Western Reserve Historical Society (1997 to 2003); Board of Directors, The Great Lakes Science Center (1997 to 2003); National Research Council (NRC) Aeronautics and Space Engineering Board, (1993 to 1998); Board of Directors, American Institute of Aeronautics and Astronautics, (1995 to 2001); Board of Directors, U.S. Space Foundation (2000 to 2006); Life Director; Board of Directors, ENSCO Inc., (2005 to present); Board of Trustees, The Aerospace Corporation (1999 to 2008); Executive Director of Investigative Activities, Columbia Accident Investigation Board (2003); Society of Distinguished Alumni, Pennsylvania State University (1986 to present); Committee on Minority Activities, College of Engineering, Pennsylvania State University (1986 to 2006); Leadership Cleveland (1995 to present); Board of Visitors, Hiram College, (2004 to 2009); Board of Advisors, Coalition for Space Exploration (2006 to 2010); Tau Beta Pi; Omicron Delta Kappa; Sigma Iota Epsilon; National Technical Association and Tuskegee Airmen. SPECIAL HONORS: Presented the Leadership Award of Phi Delta Kappa (1962); the National Defense Service Medal (1965); the Vietnam Campaign Medal (1967); the Vietnam Cross of Gallantry with Palm (1967); the Vietnam Service Medal (1967); Ten Air Force Air Medals (1967); Three Air Force Outstanding Unit Awards (1967, 1970 and 1972); the German Air Force Aviation Badge from the Federal Republic of West Germany (1969); the T-38 Instructor Pilot of the Month (1970); the Air Training Command Outstanding Flight Safety Award (1970); the Air Force Commendation Medal (1972); the Air Force Institute of Technology's Mervin E. Gross Award (1974); Who's Who Among Black Americans (1975 to 1977); the Air Force Meritorious Service Award (1978); the National Society of Black Engineers Distinguished National Scientist Award (1979); four NASA Group Achievement Awards (1980, 1981, 1989, and 2003); the Pennsylvania State University Alumni Association's Distinguished Alumni Award (1983), the Alumni Fellows Award (1986); the USAF Command Pilot Astronaut Wings (1983); NASA Space Flight Medals (1983, 1985, 1991 and 1992); the Ebony Black Achievement Award (1983); NAACP Image Award (1983); the City of Philadelphia's Philadelphia Bowl (1983); Who's Who in America (1983 to present); the Pennsylvania Distinguished Service Medal (1984); the Defense Superior Service Medal (1984); three Defense Meritorious Service Medals (1986, 1992 and 1993); New York City Urban League's Whitney Young Memorial Award; 1991 Black Engineer of the Year Award; NASA Exceptional Service Medal (1992); National Intelligence Medal of Achievement (1993); Federation Aeronautique International Komarov Diploma (1993); Legion of Merit (1993); NASA Distinguished Service Medal (1994); International Space Hall of Fame inductee (1997); U.S. Astronaut Hall of Fame inductee (2010); Air Force Institute of Technology Distinguished Alumni Award (2002); University of Houston, Clear Lake Distinguished Alumni Award (2003); The Pennsylvania Society Gold Medal (2011) and honorary doctorate degrees from Florida A&M University, Texas Southern University, Virginia State University, Morgan State University, Stevens Institute of Technology, Tuskegee Institute, Bowie State College, Thomas Jefferson University, Chicago State University, Georgian Court College, Drexel University, Kent State University, Central State University and the University of the Sciences. EXPERIENCE: Bluford graduated from Penn State University in 1964 as a distinguished Air Force ROTC graduate. He attended pilot training at Williams Air Force Base, Arizona, and received his pilot wings in January 1966. He then went to F 4C combat crew training in Arizona and Florida and was assigned to the 557th Tactical Fighter Squadron, Cam Ranh Bay, Vietnam. He flew 144 combat missions, 65 of which were over North Vietnam. In July 1967, he was assigned to the 3630th Flying Training Wing, Sheppard Air Force Base, Texas, as a T-38A instructor pilot. He served as a standardization/evaluation officer and as an assistant flight commander. In early 1971, he attended Squadron Officers School and returned as an executive support officer to the Deputy Commander of Operations and as School Secretary for the Wing. He has logged more than 5,200 hours jet flight time in the T-33, T-37, T-38, F-4C, F-15, U-2/TR-1 and F-5A/B, including 1,300 hours as a T-38 instructor pilot. He also has an FAA commercial pilot license and is a certified scuba diver. Bluford left NASA in July 1993 and retired from the Air Force to take the post of Vice President/General Manager, Engineering Services Division, NYMA Inc., Greenbelt, Maryland. In May, 1997, he became Vice President of the Aerospace Sector of Federal Data Corporation and, in October, 2000, Bluford became the Vice President of Microgravity R&D and Operations for the Northrop Grumman Corporation. In September 2002, he became President of the Aerospace Technology Group, an engineering consulting organization in Cleveland, Ohio. 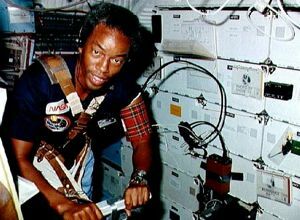 NASA EXPERIENCE: Bluford became a NASA astronaut in August 1979. His technical assignments have included working with space station operations, the Remote Manipulator System (RMS), Spacelab systems and experiments, space shuttle systems, payload safety issues and verifying flight software in the Shuttle Avionics Integration Laboratory (SAIL) and in the Flight Systems Laboratory (FSL). A veteran of four space flights, Bluford was a mission specialist on STS-8, STS 61-A, STS-39 and STS-53. Bluford's first mission was STS-8, which launched from Kennedy Space Center, Florida, on August 30, 1983. This was the third flight for the orbiter Challenger and the first mission with a night launch and night landing. During the mission, the STS-8 crew deployed the Indian National Satellite (INSAT-1B), operated the Canadian-built RMS with the Payload Flight Test Article (PFTA), operated the Continuous Flow Electrophoresis System (CFES) with live cell samples, conducted medical measurements to understand biophysiological effects of spaceflight and activated four "Getaway Special" canisters. STS-8 completed 98 orbits of the Earth in 145 hours before landing at Edwards Air Force Base, California, on September 5, 1983. Bluford then served on the crew of STS 61-A, the German D-1 Spacelab mission, which launched from Kennedy Space Center, Florida, on October 30, 1985. This mission was the first to carry eight crew members, the largest crew to fly in space, and included three European payload specialists. This was the first dedicated Spacelab mission under the direction of the German Aerospace Research Establishment (DFVLR) and the first U.S. mission in which payload control was transferred to a foreign country (German Space Operations Center, Oberpfaffenhofen, Germany). During the mission, the Global Low Orbiting Message Relay Satellite (GLOMR) was deployed from a "Getaway Special" (GAS) container, and 76 experiments were performed in Spacelab in such fields as fluid physics, materials processing, life sciences, and navigation. After completing 111 orbits of the Earth in 169 hours, Challenger landed at Edwards Air Force Base, California, on November 6, 1985. Bluford also served on the crew of STS-39, which launched from the Kennedy Space Center, Florida, on April 28, 1991, aboard the orbiter Discovery. The crew gathered aurora, Earth-limb, celestial, and shuttle environment data with the AFP-675 payload. This payload consisted of the Cryogenic Infrared Radiance Instrumentation for Shuttle (CIRRIS-1A) experiment, Far Ultraviolet Camera experiment (FAR UV), the Uniformly Redundant Array (URA), the Quadrupole Ion Neutral Mass Spectrometer (QINMS), and the Horizon Ultraviolet Program (HUP) experiment. The crew also deployed and retrieved the SPAS-II which carried the Infrared Background Signature Survey (IBSS) experiment. The crew also operated the Space Test Payload-1 (STP-1) and deployed a classified payload from the Multi-Purpose Experiment Canister (MPEC). After completing 134 orbits of the Earth and 199 hours in space, Discovery landed at Kennedy Space Center, Florida, on May 6, 1991. On his last flight, Bluford served on the crew of STS-53 which launched from Kennedy Space Center, Florida, on December 2, 1992. The crew of five deployed the classified Department of Defense payload DOD-1 and then performed several Military-Man-in-Space and NASA experiments. After completing 115 orbits of the Earth in 175 hours, Discovery landed at Edwards Air Force Base, California, on December 9, 1992. This is only version available from NASA. Updates must be sought direct from the above named individual. BIRTHPLACE AND DATE: Born in Philadelphia, Pennsylvania, on November 22, 1942. PHYSICAL DESCRIPTION: Black hair; brown eyes; 6 feet; 180 pounds. EDUCATION: Graduated from Overbrook Senior High School in Philadelphia, Pennsylvania, in 1960; received a bachelor of science degree in aerospace engineering from the Pennsylvania State University in 1964; a master of science degree with distinction in aerospace engineering from the Air Force Institute of Technology in 1974; a doctor of philosophy in aerospace engineering with a minor in laser physics from the Air Force Institute of Technology in 1978, and a master in business administration from the University of Houston, Clear Lake, in 1987. MARITAL STATUS: Married to the former Linda Tull of Philadelphia, Pennsylvania. CHILDREN: Guion Stewart III, June 12, 1964; James Trevor, October 25, 1965. RECREATIONAL INTERESTS: His hobbies include reading, swimming, jogging, racquetball, handball, and scuba. ORGANIZATIONS: Associate Fellow, American Institute of Aeronautics and Astronautics, and member of the Air Force Association, Tau Beta Pi, Sigma Iota Epsilon, National Technical Association, and Tuskegee Airmen. SPECIAL HONORS: Presented the Leadership Award of Phi Delta Kappa (1962); the National Defense Service Medal (1965); Vietnam Campaign Medal (1967); Vietnam Cross of Gallantry with Palm (1967); Vietnam Service Medal (1967); 10 Air Force Air Medals (1967); 3 Air Force Outstanding Unit Awards (1967, 1970, 1972); the Germany Air Force Aviation Badge from the Federal Republic of West Germany (1969); T-38 Instructor Pilot of the Month (1970); Air Training Command Outstanding Flight Safety Award (1970); an Air Force Commendation Medal (1972); the Air Force Institute of Technology's Mervin E. Gross Award (1974); Who's Who Among Black Americans 1975-1977; an Air Force Meritorious Service Award (1978); National Society of Black Engineers Distinguished National Scientist Award (1979); two NASA Group Achievement Awards (1980 and 1981); the Pennsylvania State University Alumni Association's Distinguished Alumni Award (1983), and Alumni Fellows Award (1986), USAF Command Pilot Astronaut Wings (1983), NASA Space Flight Medal (1983, 1985, & 1991), Ebony Black Achievement Award (1983), NAACP Image Award (1983), Who's Who in America (1983), Pennsylvania's Distinguished Service Medal (1984), Defense Superior Service Medal, Defense Meritorious Service Medal, the New York City Urban League's Whitney Young Memorial Award, the 1991 Black Engineer of the Year Award, and honorary doctorate degrees from Florida A & M University, Texas Southern University, Virginia State University, Morgan State University, Stevens Institute of Technology, Tuskegee Institute, Bowie State College, Thomas Jefferson University, Chicago State University, Georgian Court College, and Drexel University. He attended pilot training at Williams Air Force Base, Arizona, and received his pilot wings in January 1966. He then went to F-4C combat crew training in Arizona and Florida and was assigned to the 557th Tactical Fighter Squadron, Cam Ranh Bay, Vietnam. He flew 144 combat missions, 65 of which were over North Vietnam. He has logged over 5,100 hours jet flight time in the T-33, T-37, T-38, F-4C, F-15, U-2/TR-1, and F-5A/B, including 1,300 hours as a T-38 instructor pilot. He also has an FAA commercial pilot license. NASA EXPERIENCE: Bluford became a NASA astronaut in August 1979. His technical assignments have included working with the Remote Manipulator System (RMS), Spacelab-3 experiments, Space Shuttle systems, verifying flight software in the Shuttle Avionics Integration Laboratory (SAIL) and the Flight Systems Laboratory (FSL), and serving as the Astronaut Office point of contact for generic Spacelab and Shuttle External Tank issues. 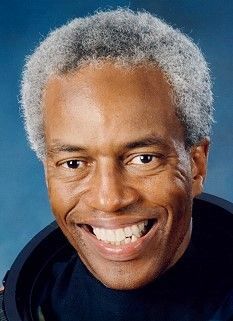 A veteran of three space flights, Bluford was a mission specialist on STS-8 in 1983, STS 61-A in 1985, and STS-39 in 1991. Challenger and the first mission with a night launch and night landing. During the mission, the STS-8 crew deployed the Indian National Satellite (INSAT-1B); operated the Canadian-built RMS with the Payload Flight Test Article (PFTA); operated the Continuous Flow Electrophoresis System (CFES) with live cell samples; conducted medical measurements to understand biophysiological effects on space flight; and activated various earth resources and space science experiments along with four "Getaway Special" canisters. STS-8 completed 98 orbits of the Earth in 145 hours before landing at Edwards Air Force Base, California, on September 5, 1983. On STS 61-A, the German D-1 Spacelab mission, the crew on board the Orbiter Challenger launched from Kennedy Space Center, Florida, on October 30, 1985. This mission was the first to carry eight crew members, the largest crew to fly in space ans included three European payload specialists. This was the first dedicated Spacelab mission under the direction of the German Aerospace Research Establishment (DFVLR) and the first U.S. mission in which payload control was transferred to a foreign country (German Space Operations Center, Oberpfaffenhofen, Germany). During the mission, the Global Low Orbiting Message Relay Satellite (GLOMR) was deployed from a "Getaway Special" (GAS) container, and 76 experiments were performed in Spacelab in such fields as fluid physics, materials processing, life sciences, and navigation. The experimental test facilities used included melting, solidification, and crystal growing furnaces, facilities for the observation of fluid physics phenomena, chambers to provide specific environmental conditions for biological samples, and a vestibular sled. After completing 111 orbits of the Earth in 169 hours, Challenger landed at Edwards Air Force Base, California, on November 6, 1985. More recently, Bluford served on the crew of STS-39, which launched from the Kennedy Space Center, Florida on April 28, 1991, aboard the Orbiter, Discovery. The crew gathered aurora, Earth-limb, celestial, and Shuttle environment data with the AFP-675 payload. This payload consisted of the Cryogenic infrared Radiance Instrumentation for Shuttle (CIRRIS-1A) experiment, Far Ultraviolet Camera experiment (FAR UV), the Uniformly Redundant Array (URA), the Quadruple Ion Neutral Mass Spectrometer (QINMS), and the Horizon Ultraviolet Program (HUP) experiment. The crew also deployed and retrieved the Spas-II with the RMS. The Spas-II carried the Infrared Background Signature Survey (IBSS) experiment, which collected Shuttle exhaust plume, Earthlimb, Earthscan, aurora, chemical/gas release and celestial data. The crew also operated the Space Test Payload-1 (STP-1) and deployed a classified payload from the Multi-Purpose Experiment Canister (MPEC). After completing 134 orbits of the Earth and 199 hours in space, Discovery landed at the Kennedy Space Center, Florida on May 6, 1991. With the completion of his third flight, Bluford logged over 513 hours in space. CURRENT ASSIGNMENT: Colonel Bluford is assigned as a mission specialist on the crew of STS-53, a Department of Defense Mission scheduled for launch in the fall of 1992. Family: Astronaut. Country: USA. Flights: STS-8, STS-61-A, STS-39, STS-53. Projects: STS. Agency: USAF. Bibliography: 12, 4457, 5177. 1942 November 22 - . Birth of Dr Guion Steward Jr 'Guy' Bluford - . Nation: USA. Related Persons: Bluford. American engineer mission specialist astronaut 1978-1993. First African-American in space. Flew 144 combat missions in Vietnam. 4 spaceflights, 28.7 days in space. Flew to orbit on STS-8 (1983), STS-61A, STS-39, STS-53..